Happy Early Thanksgiving! Tomorrow is the big day. A lot of times we get caught up in dishes that are really heavy and sometimes it’s just nice to balance it out with something lighter. Enter this soup. 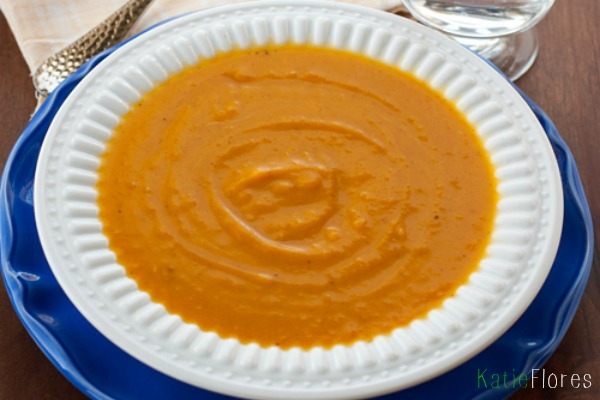 Butternut squash is packed with Vitamin A which is a great immune system stimulator that’s perfect for this time of year. It also has a considerable amount of beat-cryptoxanthin. (Simply meaning: may lower the risk of developing lung cancer). This recipe is packed with flavor so you don’t have to feel like you’re depriving yourself. Heat oil in large saucepan over medium heat. Add onion, garlic, and ginger. Cook, stirring frequently for 3 minutes. Add broth, bring to a boil. Reduce heat to low; cook, stirring occasionally, for 10-15 minutes, or until squash is soft. Place soup in a blender of food processor, in small batched (to prevent overflow). Cover with lid and blend until smooth. Place the blended soup back into saucepan. Add coconut milk and cook over medium heat for 2-3 minutes or until heated through.